There is evidence indicating there might be a connection. On the 14th of May 2012 Mark Goeder Tarant added a new moderator to the WikiLeaks Forum Facebook Staff Group Page. Her name was Julia Reiter or Anon1984, 19, Austrian, with excellent command of English, a flair for petitions and she was given a very warm welcome by all, including myself. Very soon her moderating permissions were increased and became a Global Moderator and furthermore, a Language Co-ordinator, joining me and Admin Ariana (potjeha / Jasminka) at the forum’s Volunteer Translations Project. After I left what was then “The Official WikiLeaks forum” she became an Admin. She is known with various nicks: At Forum Admin Nick: Anon1984, Facebook Page: Julia Re (ex Reiter), FoWL Austria Facebook Page, Twitter: FoWL Austria (now deleted)  & . On the 8th of June 2012 as a result of a couple of forum posts  & , she very enthusiastically created an electronic petition for “Julian Assange – No Extradition” , to be submitted to the European Parliament. Many at the forum at the time, including myself, did our utmost to share the petition around in all the social media available to us, Facebook Twitter and re-blog wherever possible. Recently I had reason to look this petition up and to my surprise I noticed several changes. It had been closed by the person that created it, with no indication if the petition with 2387 signatories had been submitted to the European Parliamant. The article accompanying it had disappeared and under the standard Avaaz heading “Why this is Important” someone had written :”it isn’t”. Most Importantly, the name of the creator had changed, from Julia R (Reiter), Austria to Sandra K. Germany . I asked myself what on earth is going on here and send an e-mail to Avaaz enquiring further information on the petition . Again and again I checked the URLs, indeed it was the same petition. I have re-visited the page today (2 days after my e-mail enquiry was sent) and the page has changed again. 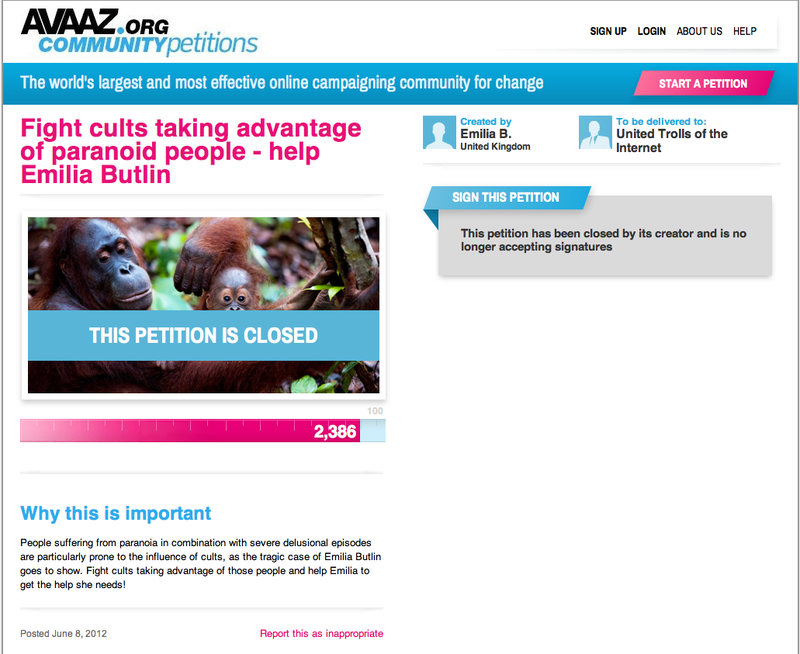 The number of signatories has reduced by one, someone has deleted an e-mail address. I wonder whether a copy of my e-mail enquiry to Avaaz has actually reached the creator of the petition, and they are covering their tracks . A day later it dawned on me. Sandra K. Eckersley is the Twitter persona identified for the last several years as an anti-WikiLeaks operator. She is identified as involved in anti- WikiLeaks website http://www.wikiwatch. org.uk  that is hosted by Alan Taylor of the PGP Board, a nest of anti-WikiLeaks personas. What is her name doing on this petition originally created by Anon1984? What is the connection between these people? Are they one and the same? Are they all part of the same operation? My investigation can only go as far, but I have such concerns about the Forum’s role in undermining WikiLeaks and Julian Assange that I here share some Facebook conversations I had with “Julia Reiter” in May-Aug 2012 which might be of interest . Once again it seems deception is at play at the pseudo wikileaks “forum”. I encourage everyone in the community to examine the facts for themselves. Instead of addressing the questions raised, the response by whoever pulls the strings at @wikileaks_forum has been a variety of rude tweets , perpetrated by the known team of helpers. 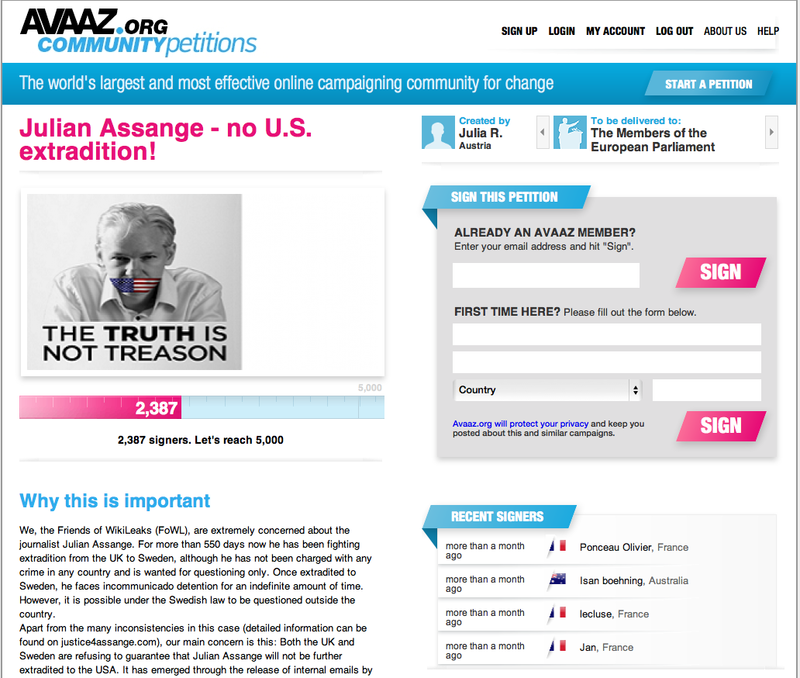 Furthermore, the Avaaz Petition has now been changed into another rude and crude expression of everything that is wrong with wikileaks-forum.com, a team of people who are out to do harm . I have a feeling, Avvaz.org never intended their services to be used in such manner. The photograph has also changed. In a simple Image Google search I note the photo appears only once before in relation to Julian Assange in website samtycke.nu. 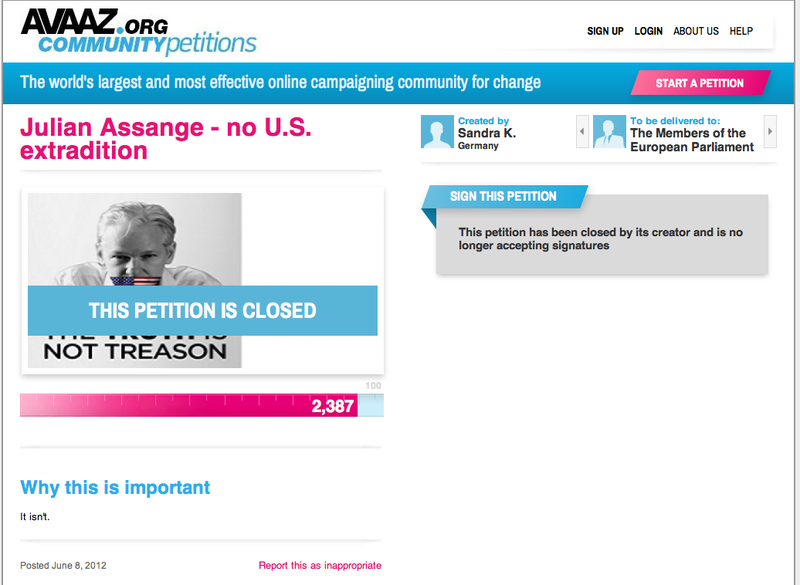 Goran Rudling is well known in the community for his polemic against Assange so it is not surprising that whoever pulls the strings at the pseudo wikileaks forum and keeps changing the petition appearance, mocking the people who signed it, refers to this well known anti-Assange website . * Contain any material which is […] abusive, offensive, harassing, violent, hateful, inflammatory or otherwise objectionable. * Be used to impersonate any person, or to misrepresent your identity or affiliation with any person or organisation. The petition today appears altered again. One more e-mail address has been deleted. The number of signatories now appears to be 2385 . The petition today appears altered again. One more e-mail address has been deleted. The number of signatories now appears to be 2384 . I have requested for an official statement and to be informed of the person responsible for violating the petition. After one year and 10 months of publishing this post Sandra K. Eckersley attempts to answer my question . Many thanks for this attempt. In case Sandra K Eckersley missed it, this blog post is primarily about documenting the abuse of an AVAAZ petition. First it was abused in not honouring the more than two thousand signatories’ wishes by delivering it to the European Parliament as advertised. Second it was abused by making it a tool to bully myself. Avaaz has de-published the petition but has not identified the identity, the e-mail address, IP address of the people involved in creating and abusing the petition. A court order or police instruction would be required to reveal the identity of the perpetrators. Until then, one can only speculate and enquire as to the real identity of the creator and abuser of the petition. As a PR professional Sandra K Eckersley may wish to approach Avaaz to establish who would be so callous as to put her name on the petition, impersonating her, she might be luckier than I was in my attempts.